By our fourth day in Charleston Mary was feeling well enough to join me on a self-guided walking tour of the French Quarter and South of Broad. She was very tired by the end of this long walk, as was I, and we were very glad to spot a street vendor on East Bay Street selling yummy sandwiches and cold drinks just a few blocks from Anchorage Inn. We ate them on a nearby bench along the sidewalk as we watched other tourists passing by. 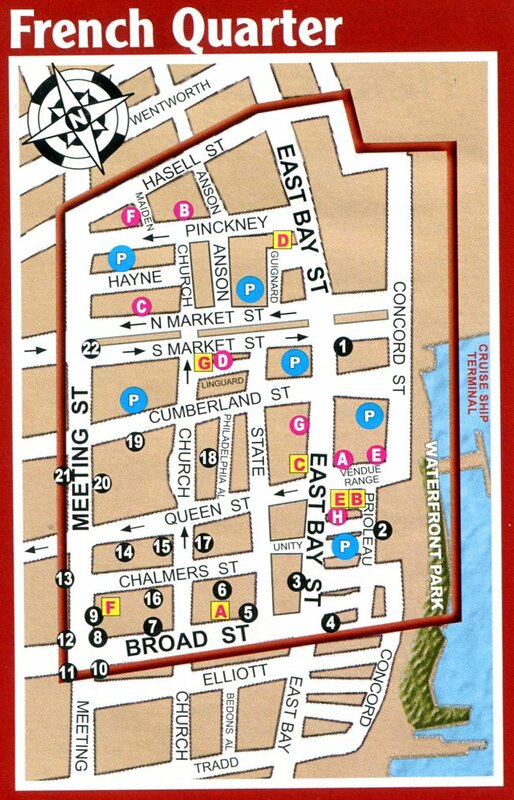 We started our tour by walking south on East Bay Street and then west on Broad Street toward the "Four Corners of Law" at Broad and Meeting Streets. Then we headed south on Meeting Street and into the South of Broad district. I cover South of Broad on the Part 2 page. Click on this map to open a copy in a separate tab for handy reference. Old Exchange Custom House and Provost Dungeon, circa 1767-1771; 122 East Bay Street, Number 4 on French Quarter map (on East Bay at the end of Broad). The "Half Moon Battery" and "Court of Guard" once stood on this spot. Numerous criminals and pirates, including the "Gentleman Pirate," Stede Bonnet, were residents of its famed dungeon. 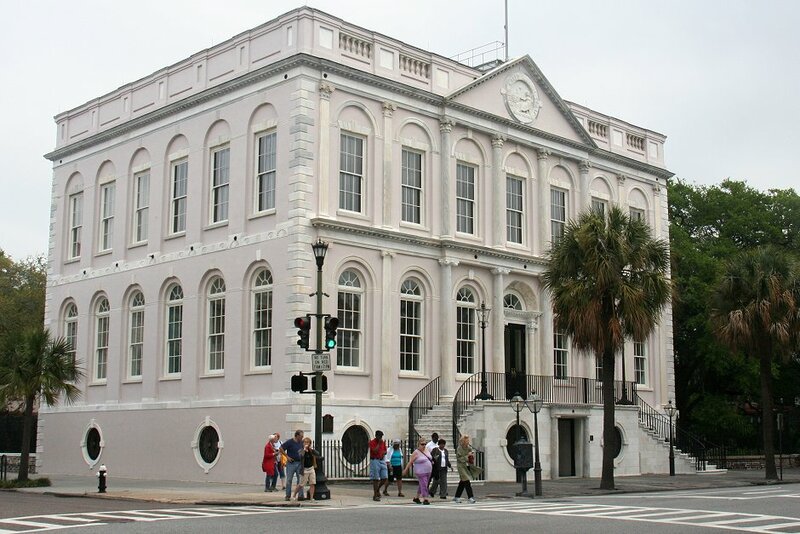 The current building (erected 1771) was home to political meetings regarding the hated Stamp and Tea Acts during the American Revolution. The British put some protestors in the jail beneath. 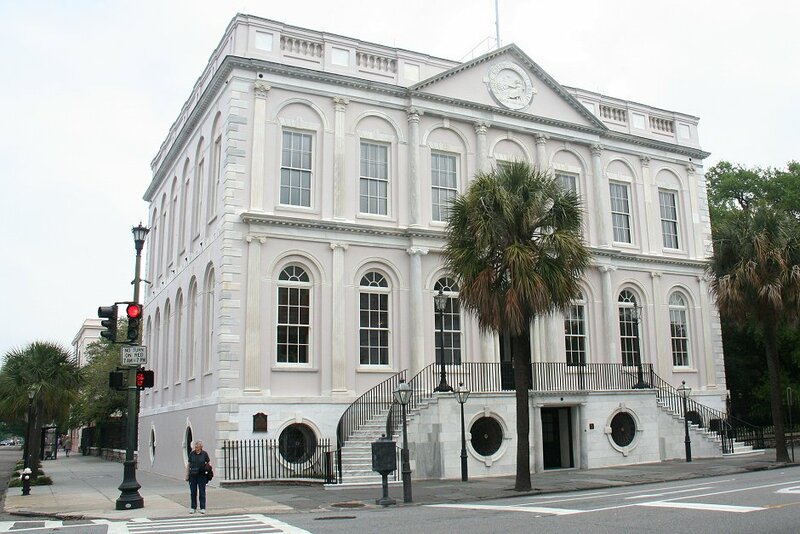 In 1791 Charleston honored George Washington by throwing a ball at the Exchange. 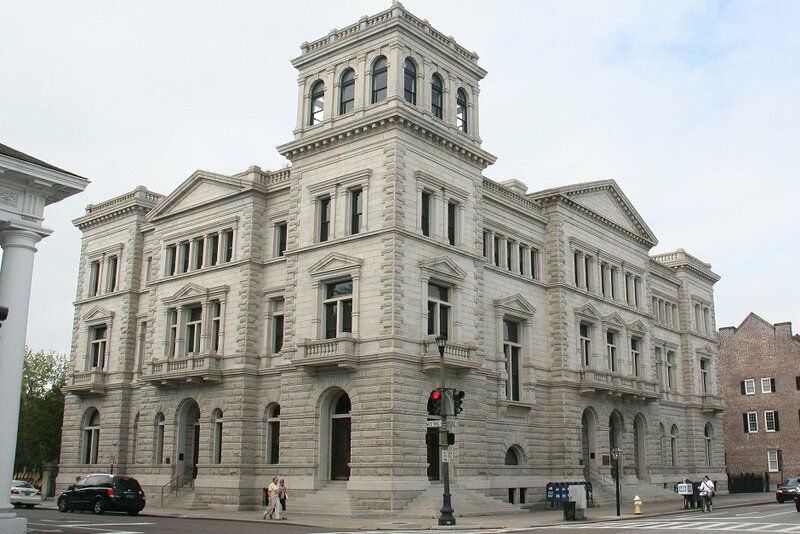 A Confederate post office, U.S. government office, and the present-day Museum make it one of the three most historic buildings in the United States. 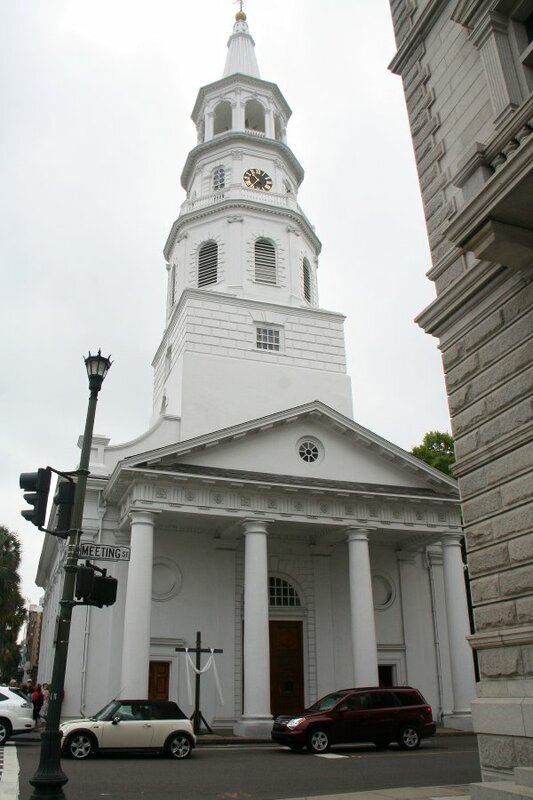 St. Michael's Episcopal Church, circa 1761; 80 Meeting Street, Number 10 on the French Quarter map. We are approaching it on Broad Street. 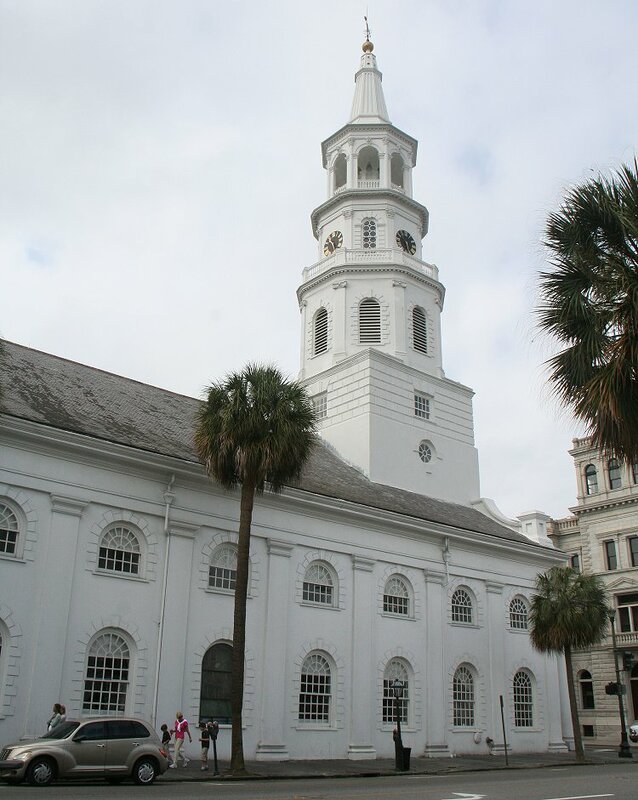 This is the oldest church building in the city of Charleston. 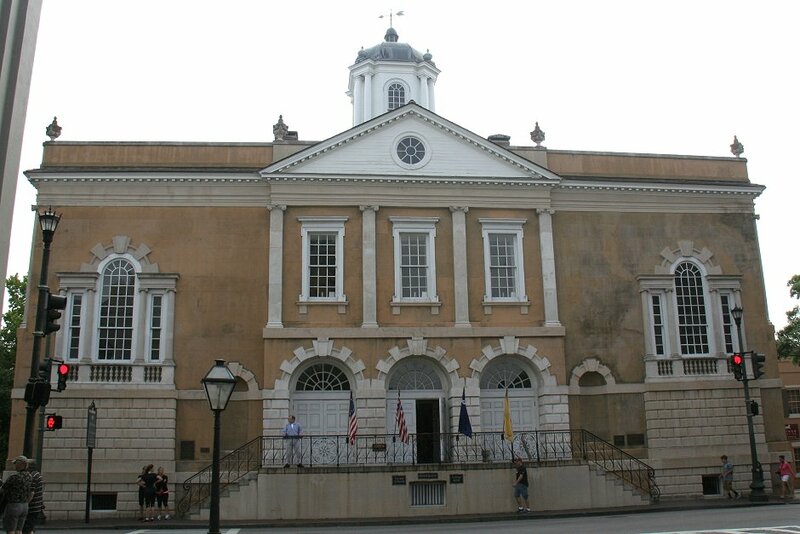 Construction started in 1752 and was finished in 1761. 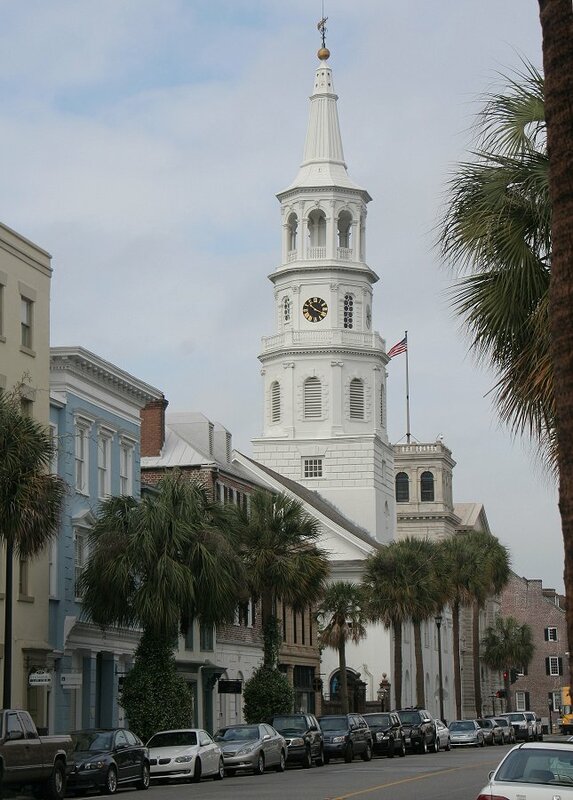 The clock and bells of the church were shipped over in 1764 from England. Couonting this shipment along with other voyages involving theft and repair, the bells have made this ocean voyage five times. 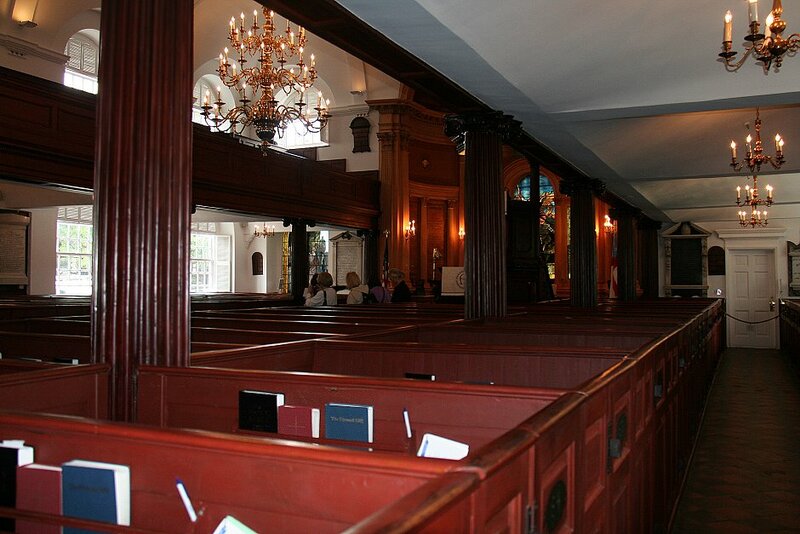 George Washington and later Robert E. Lee Worshipped in the church at pew 43. 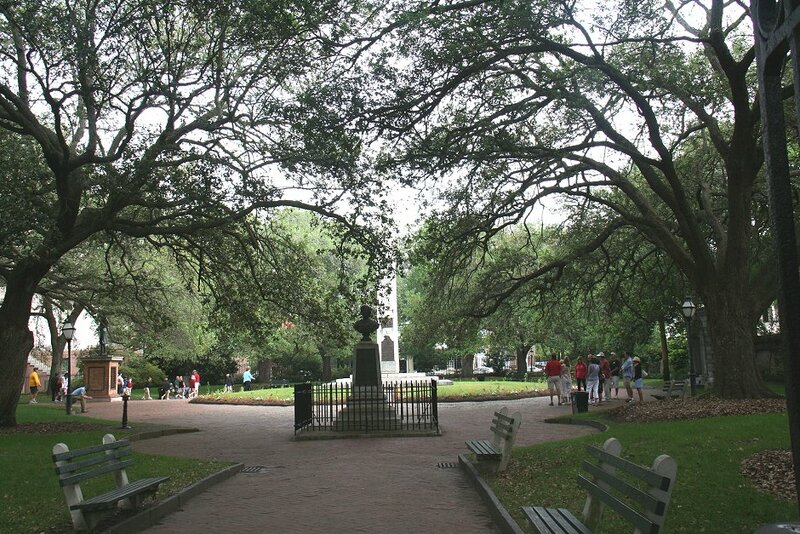 Two signers of the Constitution, John Rutledge and Charles Pinckney are buried on St. Michael's grounds. Washington Park at Broad Street entrance, with the George Washington statue on the far left facing Meeting Street. 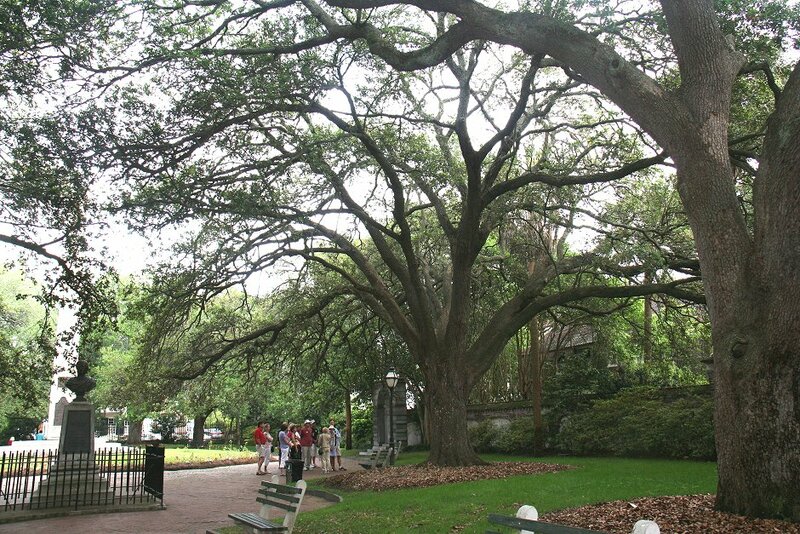 After stepping into the park farther, these huge shade oaks dominate the scene and cool the park 5 degrees. The first corner is God's law, St. Michael's Church at left and in the previous photo, and the second is Federal Law, represented by the old U.S. Post Office which is now a Postal Museum, seen here at 83 Broad Street, circled number 11 on the French Quarter map. 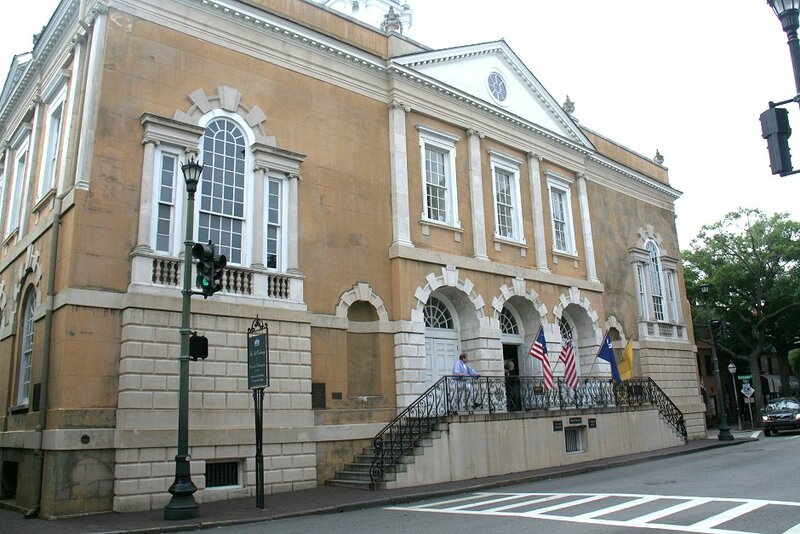 This is the third corner, City Law represented by City Hall, circa 1800-1801 at 80 Broad Street, number 8 on the map. 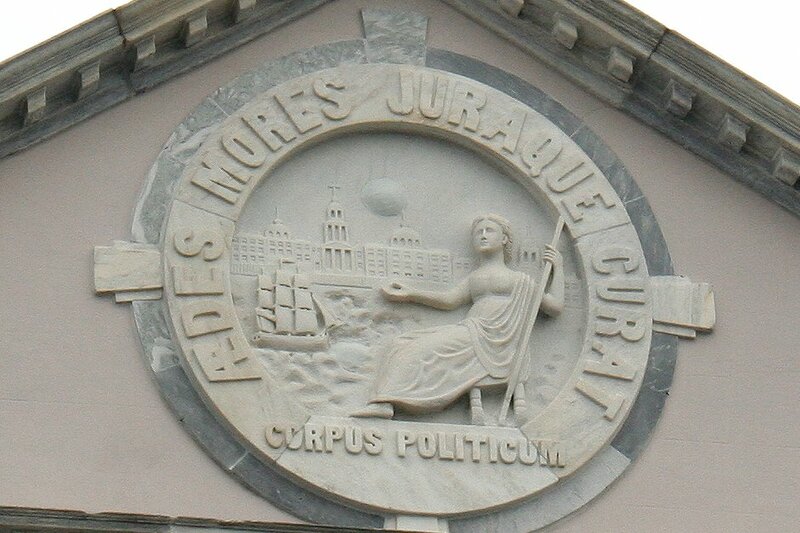 Combined low and high relief in the gable of the City Hall building. 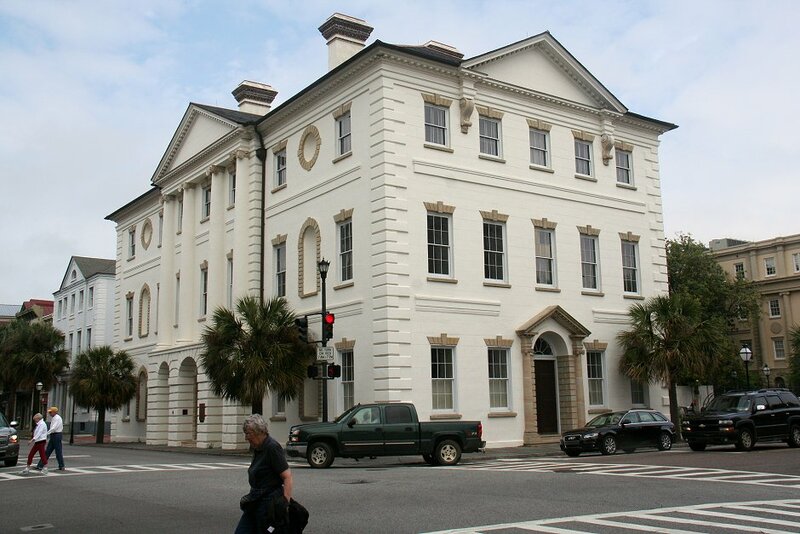 The fourth corner is county law, represented by Charleston County Court House, circa 1792, at 84 Broad Street, circled number 12 on the map. Another view of City Hall, more clearly showing its proportions. Face-on view of St. Michael's Episcopal Church taken at the Postal Museum. 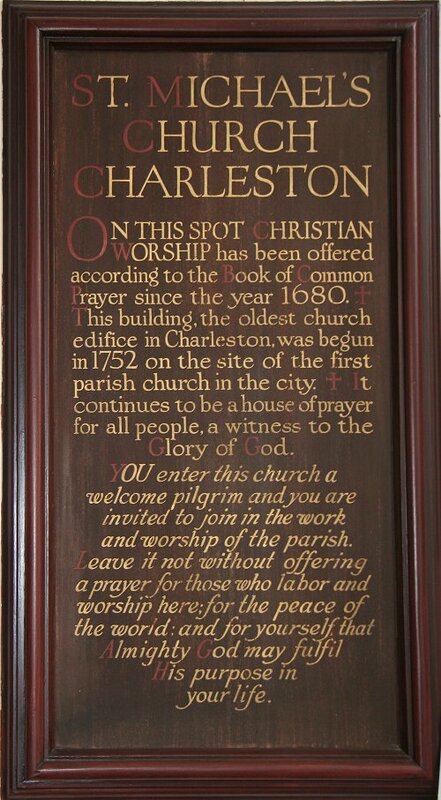 Plaque just inside the church. 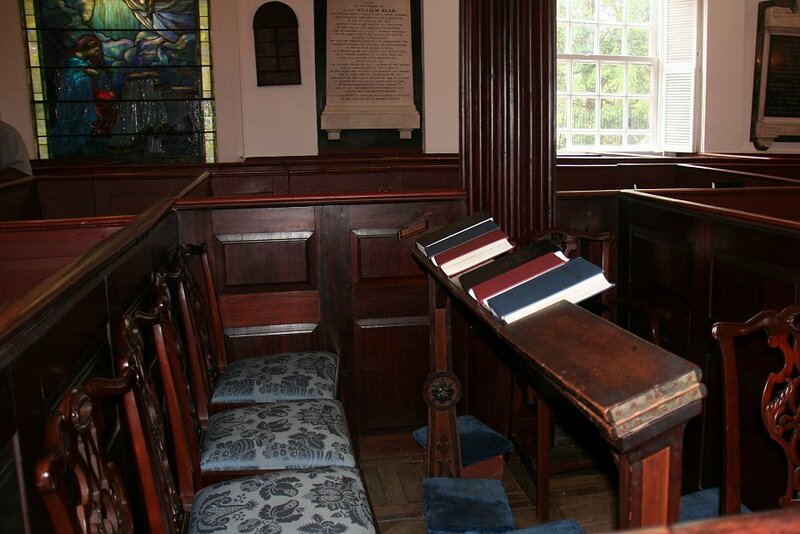 Pew box 43 on the center aisle, used by George Washington and later by Robert E. Lee. 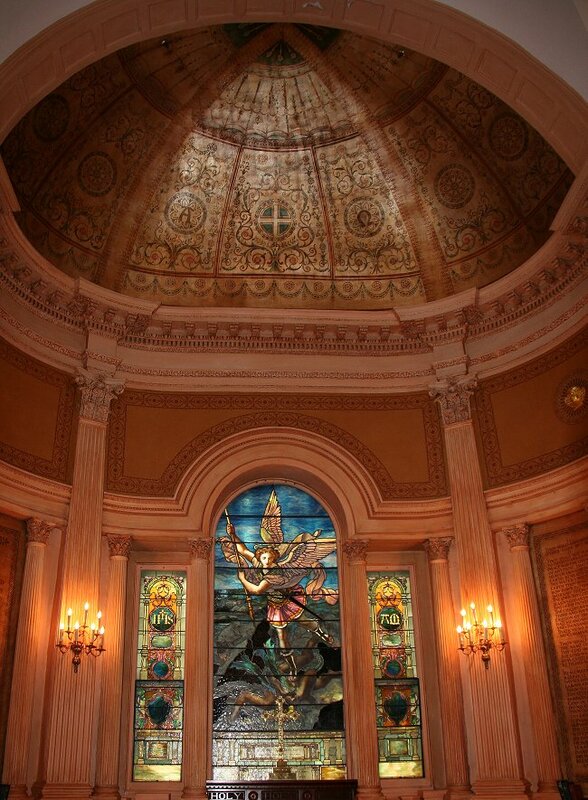 Dome and stained glass windows at the far end wall, viewed from center aisle. 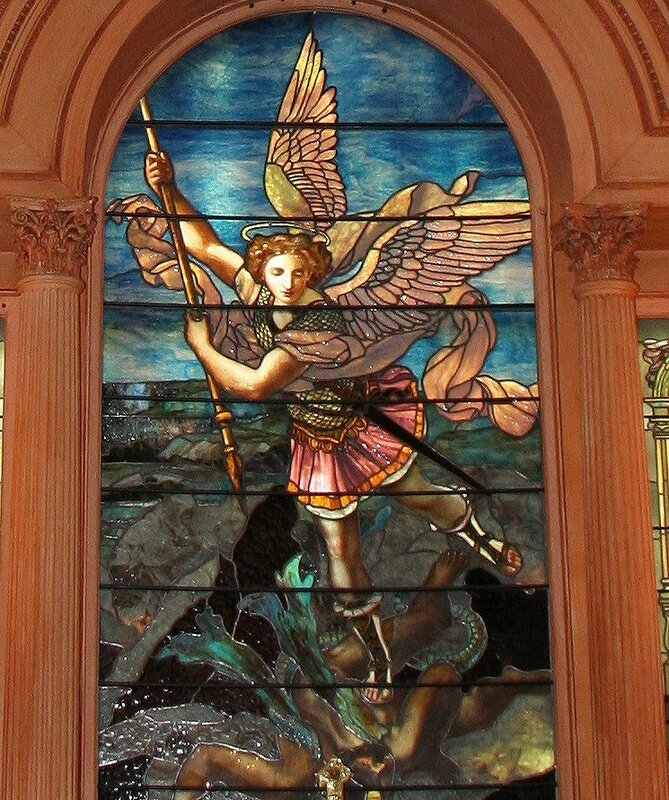 Crop into above photo to show the stained glass figures. 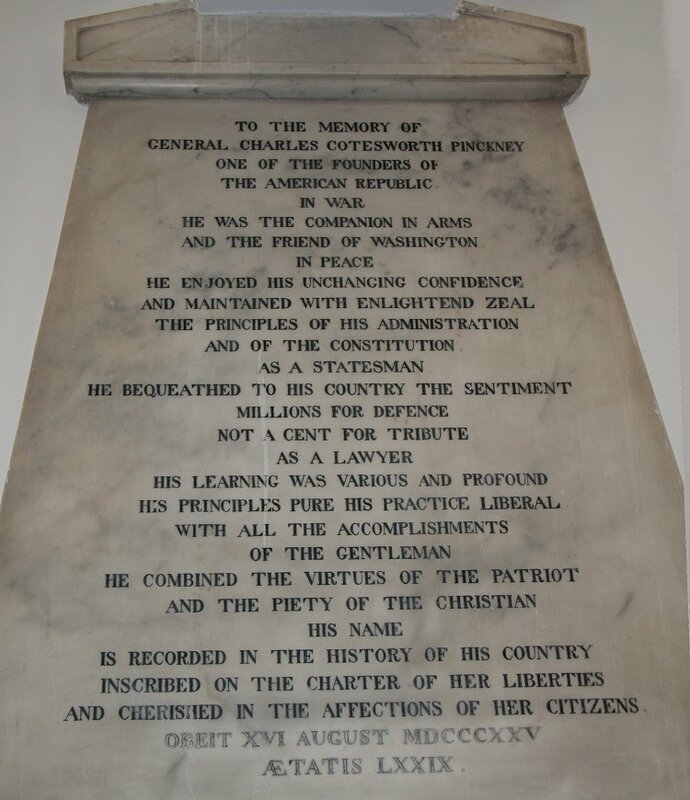 There are several memorials like this along the walls around the pew boxes.